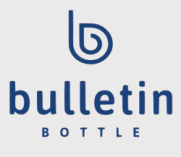 Bulletin Bottle [.com] is proud to offer a hand-picked selection of custom glass water bottles. Glass is made from sustainable raw materials and doesn’t alter the taste of its contents. It also can be recycled over and over with no loss of purity. Every custom glass water bottle is dishwasher safe, though we recommend hand washing plastic and silicone components (like lids and sleeves). Glass water bottles have a very high-perceived value and whether you choose a one-color screenprint or a full color imprint, your logo will stand out. Buying glass water bottles in bulk allows you to spend less money per bottle while maximizing the investment in your branding. Another way to customize glass water bottles is by choosing one that comes with a silicone sleeve. These protective full and partial sleeves come in a lot of color options, which means you’re sure to find one that compliments your artwork or messaging. Wholesale glass water bottles will leave a favorable impression on anybody who receives one! How do I wash my glass water bottle?